At last, Merrishaw has re-opened. Its status has changed, and is also known as the Albert Bradbeer Children’s Centre. It is no longer a nursery, but a place where young children can be brought by their parent(s) and take part in a variety of activities. However, the Merrishaw centre is open ‘for business’, still a council property and it employs its staff to guide activities. The inside has been re-furbished and looks light, modern and very impressive. There is provision for other children and community use, such as a health room. The lack of nursery provision has been compensated for by expanding provision nearby, such as at the Albert Bradbeer School itself, we are told. At last the shutters are down and the flags are up. We are proud to have been part of the vibrant parent’s campaign against its closure, and for its re-opening. Wednesday 27th June. 7.30pm Cotteridge Church Centre. Communities Against the Cuts meeting, with a speaker talking about Labour’s plans for Birmingham following the local elections where Labour took control of Birmingham City Council, and to look in detail at what the response should be. There is the commitment to give wage rises for several thousand Council employees and the right to ask a question at full Council meetings. But there is also the decision to hold the District committees (renamed from Constituency Committees) in the Council House at 10am in the morning. So much for devolution! 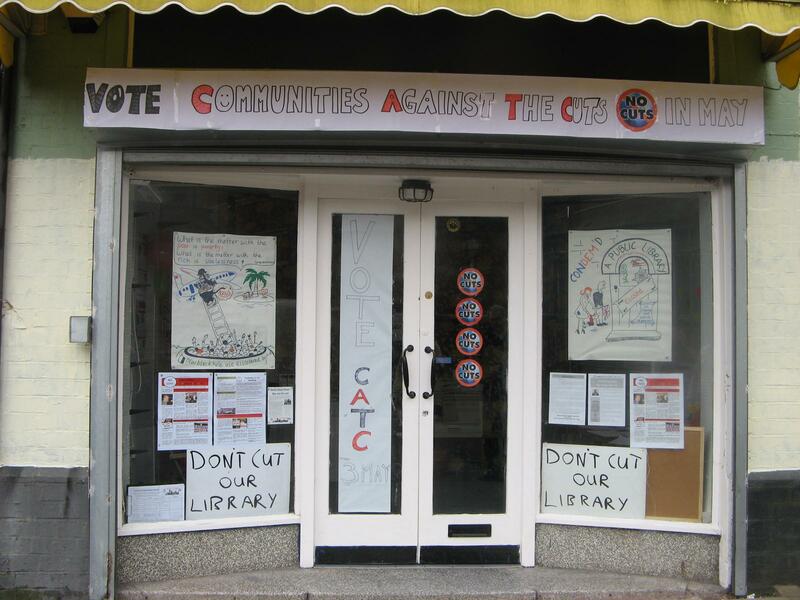 Communities against the Cuts stood candidates in the recent local elections who promised to vote against public service cuts if elected. They will also be discussing our work against academies and benefit cuts. 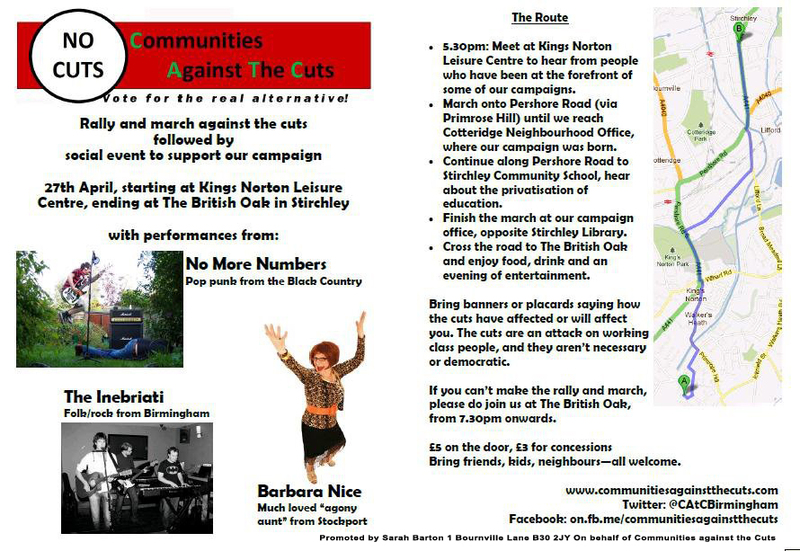 Communities Against The Cuts, who are standing candidates in the Kings Norton and Bournville wards for the council elections on May 3rd, are holding a rally and march, followed by a social event on Friday 27th April. The rally, demonstrating against cuts in the wards concerned and to raise the profile of their candidates, meets at 5:30pm outside Kings Norton Leisure Centre, where speakers will talk about the effect of cuts on local services, before proceeding along the Pershore Road to the Cotteridge Neighbourhood Office, where Stirchley and Cotteridge Against The Cuts began their campaign, and then to the Stirchley Community School to hear about the privatisation of our education services. The march will finish opposite Stirchley Library, at the group’s campaign offices. After the rally, they will go across the road to the British Oak for a social event with music and comedy from No More Numbers, The Inebriati and Barbara Nice. The social event begins at 7:30pm and you are welcome to come to that whether you can make the rally or not. Entrance to the event is £5 / £3 concessions. As you can see from their home-made shopfront, they are not a party of millionnaires and don’t have kitchen suppers with wealthy donors. What they do have is a passion for our communities, belief in a better alternative to austerity, and a willingness to take action and do something about it. Birmingham City Council has been all too eager to impose vicious cuts on the most vulnerable people in our communities, instead of going back to its pay masters and saying, the people who are hurting because of these cuts are not the ones who created this financial crisis and should not be the ones made to pay the price. 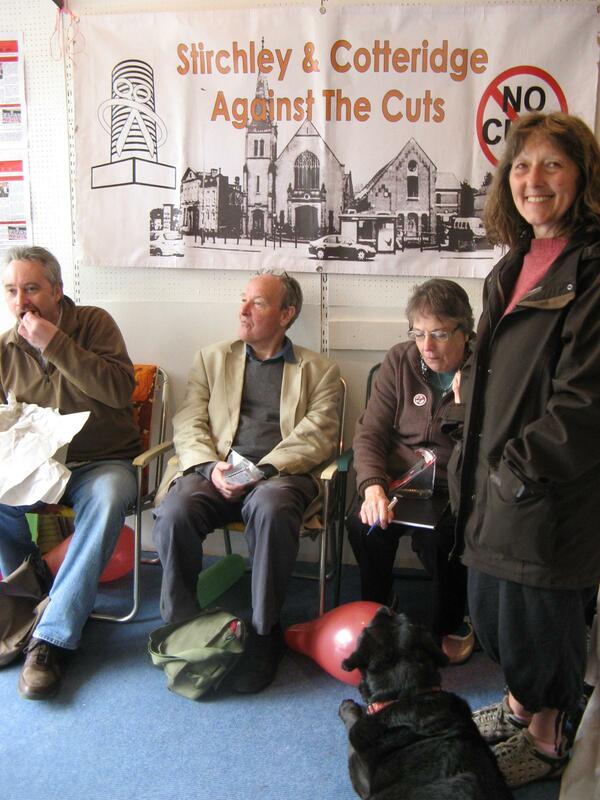 You can find out more about Communities Against The Cuts on their website – via twitter, or by visiting them at 1 Bournville Lane, Stirchley. 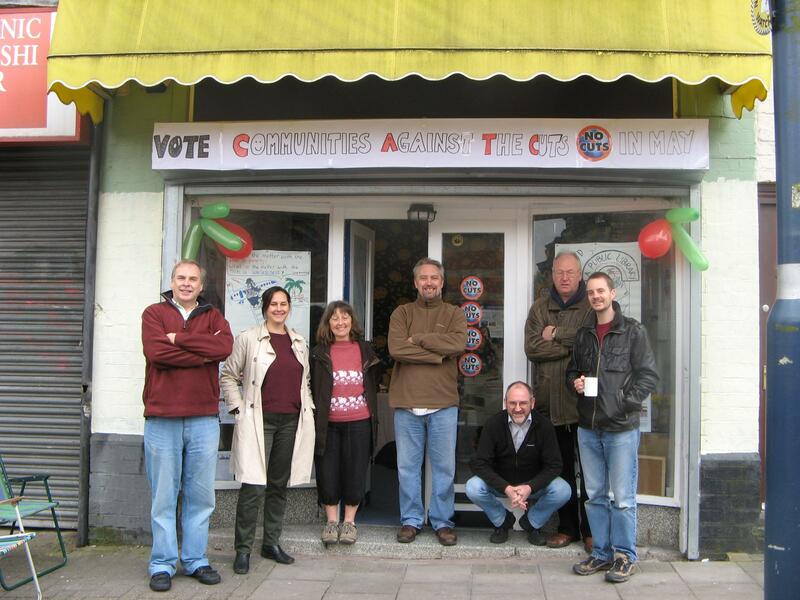 If you want to get involved with the election campaign, and help to get committed grass roots candidates to fight for local services in the council chambers, then pop into their shop office and have a chat – whether you have 5 minutes or an hour to spare, there will be something you can do. The Coalition that runs Birmingham City Council (or rather, is running it into the ground), has decided to slash the library service opening hours. 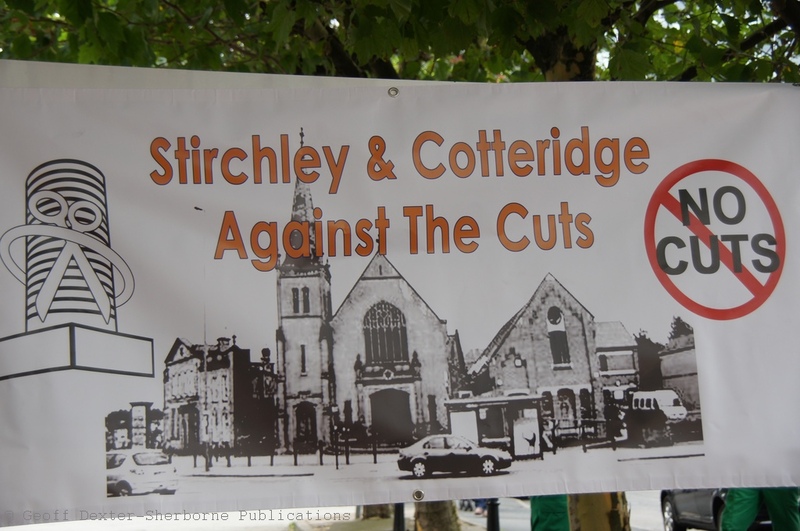 One of the libraries affected is in Stirchley. It is now proposed to close it on Fridays as well as on Wednesdays. 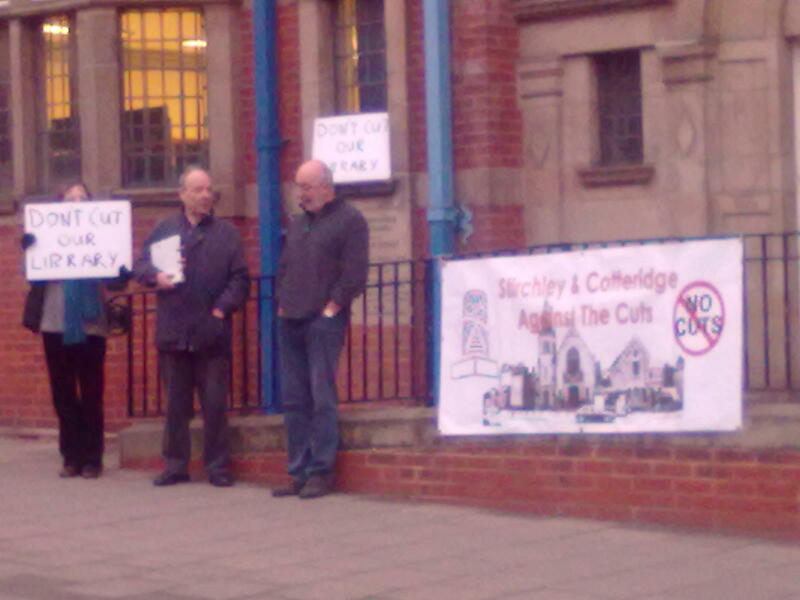 So, Stirchley and Cotteridge against the Cuts turned up on Thursday evening to let the staff, library users and local people know that there are people around who do not think that nothing can be done to stop such “cultural vandalism” (to use Councillor Dawkin’s description of the decision to move the Bournville School of Art out of Bournville). As usual, people were keen to sign the petition and passing motorists were keen to honk in support. Then, lo and behold, who should turn up but Councillor Dawkins himself! He announced that the decision to close it for an extra day was his, and that he had done it to the library in order to save it! Now, there is not much you can say to chop-logic like that, but, put it this way, there was an exchange of views. He was then at pains to say that with coming investment it would re-open for five days several years into the future. Jam tomorrow, eh! But he did not seem too keen to talk about other massive cuts imposed on the people of Birmingham by his ConDem coalition. That it seems, was nothing to do with him. A significant number of comments, representations and consultation responses were received with regard to the provision of respite services to those young people, such as attending Charles House, indicating the value and importance of the service to their well-being, personal development and families. The commitment shown by parents, staff and young people as expressed at the Northfield Ward Committee Meeting and at the meeting, as you detail in your question, was an important factor in the consideration of the future for Charles House. I can therefore confirm that Charles House will continue to be a vital component in the overall provision of respite services. Already changes to the process by which places are provided have occurred, staffing profiles assessed, to enable improvements in the access to and provision of placements. Therefore Charles House, which has on three separate occasions been judged by OfSTED as outstanding, will continue to provide high quality respite care for young people together with supporting their families underpinned by staff who are highly respected. This victory was achieved by high-profile, effective and militant campaigning, led by the parents themselves. It was all organised at regular mass parent meetings; they planned the press campaigning, the lobbying, the letters to be written and the relevant meetings to be attended. These meetings also invited in Council officials such as Eleanor Brazil, legal experts and Les Lawrence himself. Some Labour Councillors turned up at times of their own volition, others had to be dragged. SACAC members were proud to have been invited in for every meeting, to give support and advice on campaigning strategy. 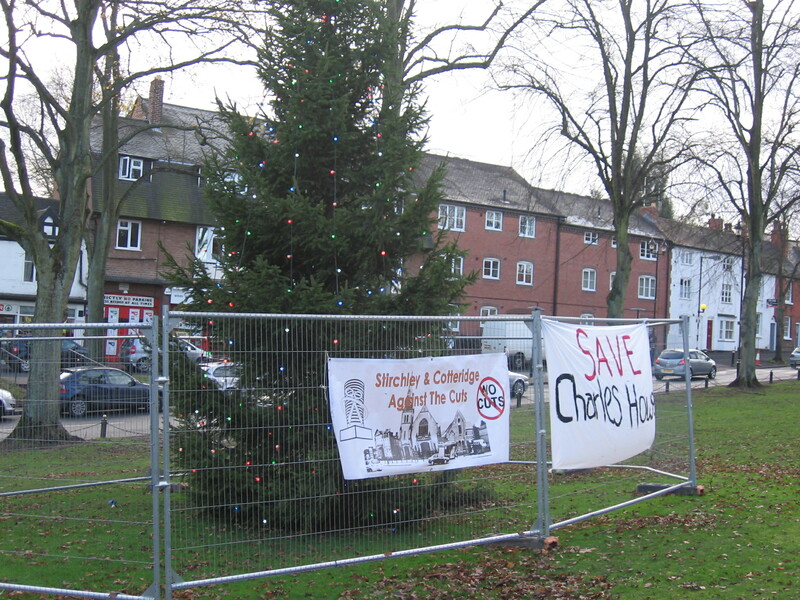 But it was SACAC that pioneered the two most public demonstrations, a street corner Saturday morning stall in Cotteridge on Saturday 5th November and on the Kings Norton Green on Saturday 10th December. This latter event was preceded by parents, children and SACAC members filling up Councillor Steve Bedser’s surgery to bursting point and winning Steve’s active support for Charles House. 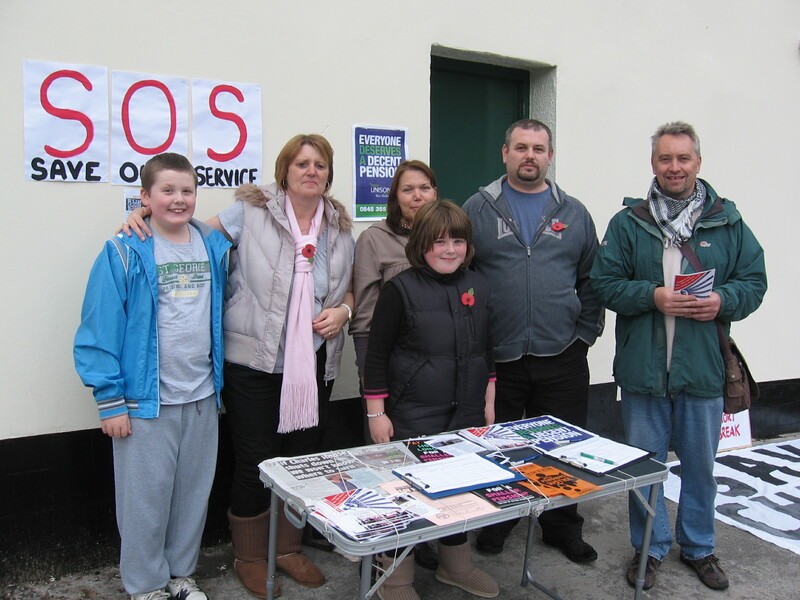 At both stalls the public support received was overwhelming. It was also SACAC that accompanied the parents to a memorable Northfield Ward Committee meeting on Monday 21st November. To say that the campaign made its point forcibly would be an understatement. It was probably the turning point – as acknowledged in the letter above. Councillor Lawrence was reminded in no uncertain terms of the promise he had made to keep Merrishaw Community Day Nursery open, only for the shutters to go up soon after. When we all trooped out having made our point, Cllr Lawrence followed, and spoke to us in a very different tone of voice. It was probably at this point that it was realised a big mistake had been made. So, the articles in the press, the coverage in the B31 blog, the lobbying of Councillors, the street demonstrations, the letters written and the solidarity achieved by keeping all parents together, plus the support of the local anti-cuts group, made a victory possible. 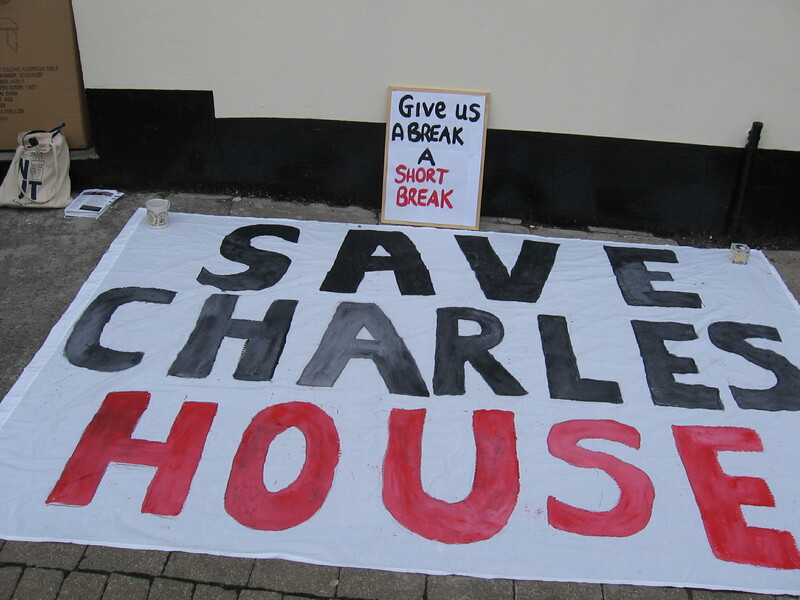 We, of course, hope that the survival of Charles House is not at the expense of any other such house or Council services. But if anywhere else does feel threatened, the service users concerned can take a leaf out of the Charles House parents’ campaign to see how to defend themselves. If and when the Council cutters come for any other vital services in this part of the city, be rest assured that SACAC will be there once more. And while we think about it, is it not time to consider re-opening Merrishaw Community Day nursery?